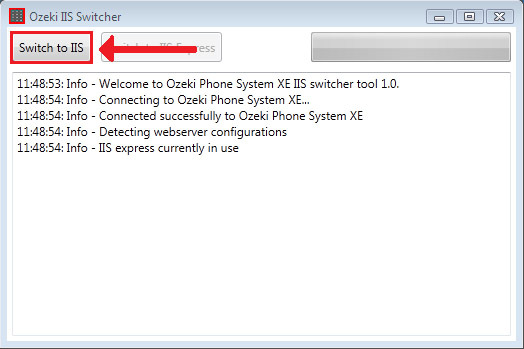 Ozeki Phone System XE uses IIS Express for its web interface by default. If you are using IIS as your web server in your comany then you dont have to give up on using the Ozeki Phone System XE, because it has a built in application that can swith between the IIS and the IIS Express. This way you will be able to take advantage of the services of Ozeki Phone System XE without having to give up on using IIS. It is really simple to use the application, you just have to click on a button for switching between the web servers. Let's see how it works. 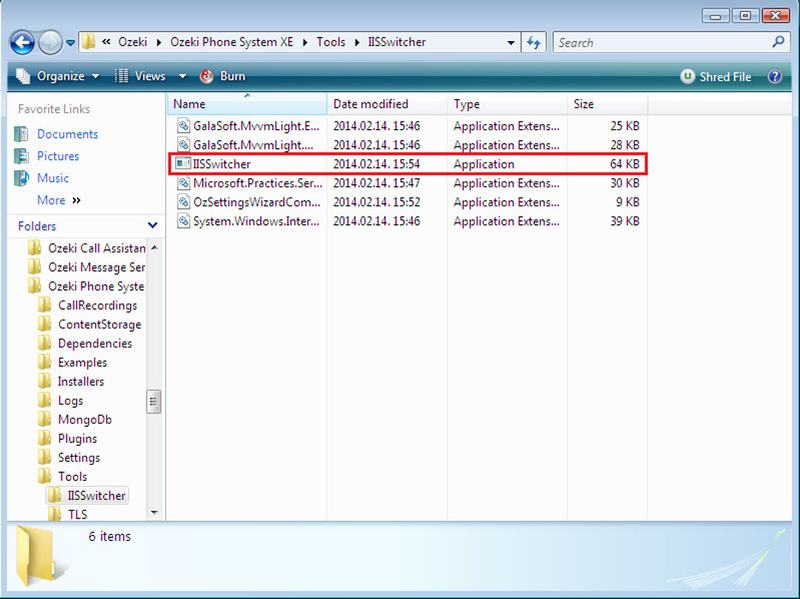 You can access the application in the C:\Program Files\Ozeki\Ozeki Phone System XE\Tools\IISSwitcher\ directory. Double click on the IISSwitcher application to start the program, as you can see on the figure below. You will need to turn on the ASP.NET inside the IIS feature to be able to use this application. If it is turned on then just simply click on the Switch to IIS button. 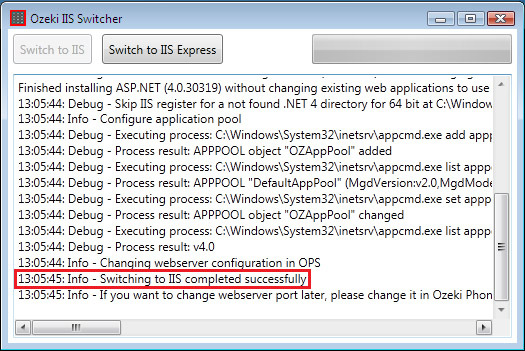 If the IIS is properly configured then the switching should happen without any problems and you should see the following. 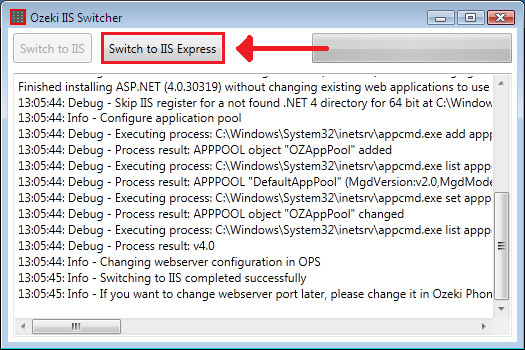 You can switch back to IIS Express if you want, but you are not obligated to do so. For the sake of this example I am goint to switch back to IIS Express to show you that this function work too. To do so just click on the Switch to IIS Express button. 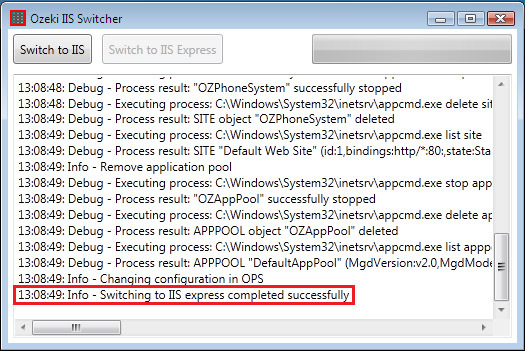 You will see that the application has switched back to IIS Express successfully, like on the figure below. As you could see from the example above, it is really simple to use the IIS Switcher application, you just have to click on the proper buttons. With the help of this application you can keep your old IIS along the usage of Ozeki Phone System XE.